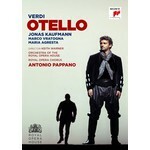 'Jonas Kaufmann Sings an 'Otello' for the Ages'- New York Times. On a sweltering night at London's Royal Opera House in June 2017, Jonas Kaufmann made his debut performance as Otello - one of the most coveted and challenging roles in the tenor operatic repertoire. The Guardian commented on his performance: "Kaufmann thrills in a dark, expres-sionistic staging". This new production by director Keith Warner presents a simultaneously modern and abstract approach to one of Verdi's greatest operas. The DVD and Blu-Ray will also include two short bonus features: - An introduction to the opera & a short feature about the music of the opera with the conductor and tenor.